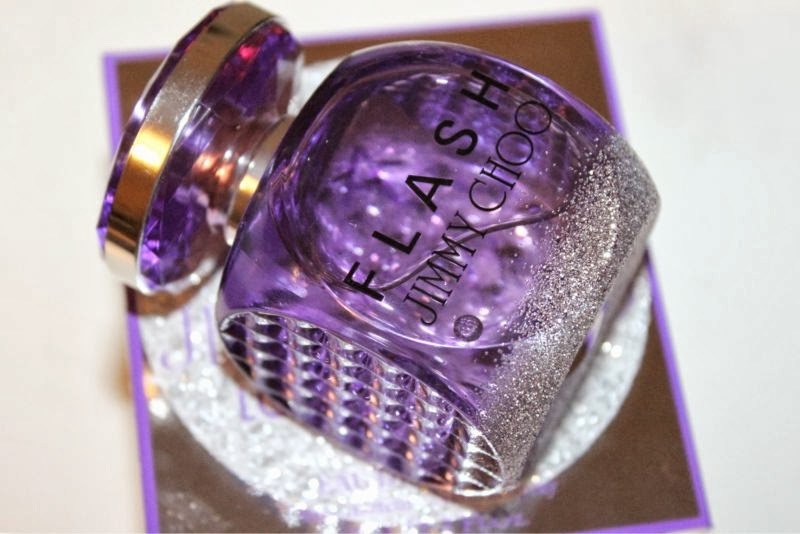 Launching on the 8th of January exclusive to World Duty Free is the second and limited edition fragrance offering from Jimmy Choo - Jimmy Choo Flash London Club which will then go on sale nationwide on the 26th of January. Jimmy Choo Flash London Club has been created to capture the unparalleled glamour and excitement of London’s hedonistic night life. I can't comment on London night life having never experienced it but the bottle is enchanting - a deep purple glass flanker with a silver glitter gradient accent. The bottle is said to take its inspiration from the fluorescent glow of the lights of a London nightclub. I have to be truthful and say it is not as classy in terms of design as the original Jimmy Choo fragrance but it is not without its charm. Flash London Club is officially described as an ultra-modern, floral fruity musk based perfume that takes inspiration from a bouquet of white flowers punctuated with sparkling top notes of litchi and bergamot. For what is being marketed as a night time fragrance it is very light and delicate in some aspects and despite what the packaging may indicate appropriate for day wear. As soon as I sprayed this on my skin this morning it instantly reminded me of another fragrance and that is Paco Rabanne's Ultra Violet. The main difference between the two is that Jimmy Choo Flash London Club is softer and has more obvious white notes but if you like Ultra Violet you will more than likely enjoy this too. I only have the World Duty Free prices for Jimmy Choo Flash London Club EDP £46.40/100ml and 60ml/£33.60 but I imagine a good indicator of high street prices would be to add the UK rate of tax on top? If I have that wrong feel free to chastise me in the comments. I never used to purchase perfumes for myself I used to be one of those that simply left it to Christmas and my birthday but I've recently started to buy a few for myself and start a little collection! This may be my next purchase! The bottle is so lovely~ I am a huge sucker for packaging! I've never smelt any Jimmy choo perfumes but the way you described the scent, i think it would be something i would personally like for myself. Love the bottle, any word on gift sets? I've always been a Marc Jacobs girl, probably need to change it up once in a while right? I love Jimmy Choo too though! I would love to smeel this! The bottle looks so luxurious and pretty! I liked the original fragrance from Jimmy Choo so I can only imagine what this one will be like! Gorgeous bottle! I'm a big fan of the Paco Robanne Ultraviolet so will be interesting to see how this compares - I look forward to purchasing!